Here are 3 reasons to read Lawrence Gladeview's debut book Just Ignore the Beer Stains (PigeonBike Press). 1. "I signed eight books/ & was told pound/ would punch me/ right in the nose." 2. "one day/ that typewriter/ will score/ me an exit." 3. "never did see/ lorraine again,/ her pie was/ sweetest of all." 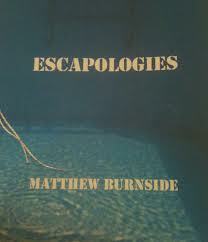 20 Reasons to Read "Escapologies"
Here are 20 reasons why you need to pick up a copy of Matthew Burnside's new chapbook "Escapologies" from Red Bird Chapbooks. Each of these lines is from "Escapologies", which was printed by Red Bird Chapbooks in 2013. "in your mouth the stubborn stir of birds" (13). "you look down at your daughter underfoot flapping her arms with the quickening hope of/hummingbird wings & know she will be clean" (14). "That tomorrow a blanket of fog that had obscured the torch-tips of/tinny stars above could lift like accidental Baptism to lantern your way / home" (15). "She's sick of not knowing the question" (16). "the lonely gears / that grind a man's heart cannot be unwound" (17). "Making art of his scars he swirls scab frescos" (18). "The big bad wolf wasn't born that way- it took years of / parental malpractice to make imperfect" (19). "Now she can't stop feeding her awful appetite" (20). "Everything is never too late until it is" (21). "Every muscle was a taut string in a grand piano missing / its white keys" (22). "…we explored the one billion/ possibilities of bumblebee assassination" (23). "He is unafraid to die" (24). "I've never seen anything as sinless as your pale thin/wrists--file under Things I Should Have Told You When I Had You Here / In The Passenger Seat " (25). "Judas kissed the wrong guy" (26). "We returned to the sacred cows" (28). "rain eventually swallows everything" (29). "give me the neon knives of your eyes clean careening, in free flight at/ maximum aperture" (30). 'girl, your Sega Genesis heart is so precious" (31). "everyone is hungry for / something everyone is full" (33).